Magic Knight Rayearth anime, manga, and gaming series by CLAMP images and info. Part of a diverse shoujo anime, manga, video gaming, and live-action Japanese drama website. 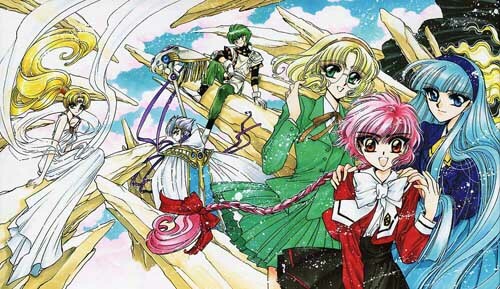 "Magic Knight Rayearth" by CLAMP (X, Cardcaptor Sakura, RG Veda, Tokyo Babylon) is a gorgeous fantasy world adventure story, which ran in the manga magazine Nakayosi. The story is retold in a completely different way in the OAV series, and the Magic Knights appear in the CLAMP music videos. Hikaru, Umi, and Fuu, 3 girls from different schools, go to Tokyo Tower on the same day for a field trip and suddenly are summoned to another world called Cefiro. The princess Emeraude, pillar of the world who keeps it from chaos, needs them to become legendary Magic Knights in order to save Cefiro from destruction. The youthful-looking magician Clef explains that the girls cannot return home until the princess' wish is fulfilled, so they must find and battle the priest Zagato who has kidnapped the princess. Pink-haired Hikaru, an energetic and friendly girl, eagerly jumps at the chance to rescue the people of Cefiro. Umi, a beautiful and tempermental fencer, is not nearly so thrilled, but Fuu, wise and logical, points out what needs to be done. The girls are very different, but together complement each other amazingly well. Clef gives the girls armor and weapons, and to Hikaru a magic spell. Before Umi and Fuu can each receive a magic power, an enemy appears! Along with the ultra-cute animal Mokona, the three girls fly off to the Forest of Silence to meet Presea, a young woman who crafts magic swords. Without special growing weapons they can't hope to defeat the forces of Zagato. Along their journey to become Magic Knights they meet new friends and enemies. The key to winning against Zagato is the mysterious Mashin. 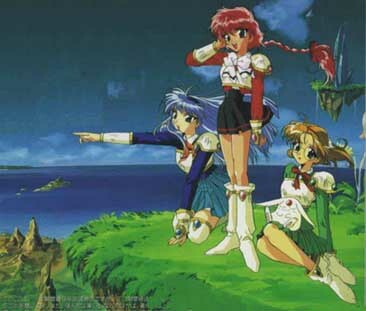 The second season of the series is based on the second manga series, which covers the girls' second visit to the world of Cefiro. As it turns out, there are even more plot twists to come! Fuu is a fan of RPG (role-playing games) and comments on the difference between battling in Cefiro against live opponents versus those of video games. It's only natural that this fantasy quest series would be made into real video games! Packed with discovery, battles, smooth gameplay, new original dialogue by the voice actors from the anime, exclusive characters, and all of the favorite characters from the anime, the Sega Saturn game (which I've played) is definitely recommended! I hope to acquire and play the other Magic Knight Rayearth games as well. One of the most enjoyable points of this series is meeting the various characters that the Knights come across. Each character has a distinct personality, and it's easy to find a favorite in the wide variety. Breathtaking art, surprising plot twists, original characters, amazing mecha, and cool fight scenes add up to one series you absolutely can't afford to miss! The #1 series by super women team CLAMP!